The brain and spinal cord are surrounded by a clear fluid called cerebrospinal fluid (CSF). 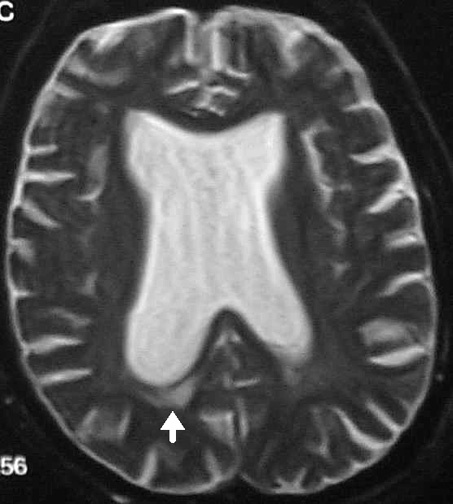 This fluid is produced and stored in cavities in the brain called ventricles. It circulates around the brain, moving from ventricle to ventricle. The purposes of the fluid are to cushion and protect the brain and spinal cord, to supply them with nutrients, and to remove some of their waste products. Any excess fluid drains away from the brain and is absorbed by veins at the top of the brain. Hydrocephalus is a condition in which there is too much CSF in the ventricles. This occurs when the natural system for draining and absorbing extra CSF does not work right. The ventricles enlarge to accommodate the extra fluid and then press on different parts of the brain, causing a number of different symptoms. Hydrocephalus has many different causes. Some people are born with the condition, while others develop it during their lives. Normal pressure hydrocephalus (NPH) is a type of hydrocephalus that usually occurs in older adults. The average age of person with NPH is over age 60. NPH is different than other types of hydrocephalus in that it develops slowly over time. The drainage of CSF is blocked gradually, and the excess fluid builds up slowly. The slow enlargement of the ventricles means that the fluid pressure in the brain may not be as high as in other types of hydrocephalus. However, the enlarged ventricles still press on the brain and can cause symptoms (the term "normal pressure" is somewhat misleading). The parts of the brain most often affected in NPH are those that control the legs, the bladder, and the "cognitive" mental processes such as memory, reasoning, problem solving, and speaking. This decline in mental processes, if it is severe enough to interfere with everyday activities, is known as dementia. Other symptoms include abnormal gait (difficulty walking), inability to hold urine (urinary incontinence), and, occasionally, inability to control the bowels. The dementia symptoms of NPH can be similar to those of Alzheimer's disease. The walking problems are similar to those of Parkinson's disease. Experts say that many cases of NPH are misdiagnosed as one of these diseases. The good news is that, unlike Alzheimer's and Parkinson's, NPH can be reversed in many people with appropriate treatment. But first it must be correctly diagnosed. Normal pressure hydrocephalus can occur after a head injury, bleeding around the brain (due to a blow to the head), stroke, meningitis (infection of a protective layer of tissue around the brain), or brain tumor. It can happen after surgery on the brain. How these conditions lead to NPH is not clear. In most cases, the cause of NPH is never known. At first, the symptoms of normal pressure hydrocephalus are usually very subtle. They worsen very gradually. Some people think that memory loss, difficulty finding words, walking problems, or urination problems are normal parts of aging. In many cases, however, these are symptoms of treatable conditions. Any of these problems, or changes in mood or behavior, warrants a visit to your health care provider. The symptoms of normal pressure hydrocephalus can also occur in Alzheimer's disease and Parkinson's disease. However, the combination of dementia-like symptoms, walking problems, and urinary problems should alert your health care provider to the possibility of NPH. Making the distinction is very important because the treatments for these conditions are quite different. Tests are available that can diagnose NPH. At any point in this process, your health care provider may refer you to a specialist in brain disorders (neurologist or neurosurgeon) to complete the evaluation and begin treatment. The evaluation begins with a medical interview. The medical professional will ask you questions about your symptoms and when they started, your medical and mental problems now and in the past, your family's medical problems, medications you have taken now and in the past, your work and travel experiences, and your habits and lifestyle. This is followed by a detailed physical exam to document your condition and rule out other disorders that might cause similar symptoms. The exam will probably include tests of your mental status, such as answering questions and following simple directions. Neuropsychological testing may be performed to document your dementia symptoms. Neuropsychological testing is the most accurate method of pinpointing and documenting a person's cognitive problems and strengths. CT scan of the head: This scan is similar to an X-ray but gives a more detailed, 3-dimensional picture of the brain. It cannot confirm a diagnosis of NPH, but it can show ventricular enlargement or other changes that suggest NPH. Newer techniques can actually measure the flow of CSF in the brain. These findings alone may not be sufficient for diagnosis. This scan is safe and painless. MRI of the head : This scan uses radio signals and a strong magnet to create a detailed picture of the brain. It is safe and painless, like a CT scan, but takes longer (about 30 minutes). It also cannot confirm a diagnosis of NPH. Cisternography: This test is much more involved than CT scan or MRI and is not widely used. It highlights absorption of the CSF. Lumbar puncture (spinal tap): This procedure involves removal of CSF from the area around the spinal cord in the lower back. The CSF pressure is measured, and the fluid that is removed is analyzed for abnormalities that might give a clue as to the problem. Usually, more fluid is removed than is necessary for these tests, the idea being that removal of a large volume of CSF may help relieve symptoms (this is checked by comparing exam results before and after). If symptoms are relieved, it is usually temporary; improvement of symptoms with lumbar puncture is commonly interpreted as meaning that a surgical shunt would be helpful in that person. An individual with normal pressure hydrocephalus should always be under the care of a medical professional. Much of the day-to-day care, however, is handled by family and caregivers. Medical care should focus on optimizing the individual's health, safety, and quality of life while helping family members cope with the many challenges of caring for a loved one with dementia and other symptoms of NPH. The degree of care required by people with NPH varies considerably. Those who undergo successful shunt surgery may continue to live a normal or near-normal independent life. Others will experience worsening of their symptoms over time. Many of these individuals will eventually require close supervision and care. Your neurologist or neurosurgeon should discuss with you and your family what to expect as time goes on. It's important to know that no drug or other medical treatment is known to work in NPH. Normal pressure hydrocephalus is not caused by any structural abnormality, such as a brain tumor. In most cases, the underlying problem is not known or cannot be treated. The treatment in these cases is a shunt operation. A shunt is a thin tube that is implanted in the brain by a neurosurgeon. It is inserted into the ventricles to drain excess CSF away from the brain. The tube is routed under the skin from the head to another part of the body, usually the peritoneum (the lower belly). The shunt is equipped with a valve that opens to release fluid when the pressure builds up. The fluid drains harmlessly and is later absorbed by the bloodstream. The pressure setting on the valve sometimes must be readjusted. The newer shunts allow adjustment without another operation. A shunt operation is not a cure. It does not treat the underlying cause of NPH. It can, however, relieve the symptoms. The shunt remains in place indefinitely. If properly implanted, the shunt often is not obvious to other people. Shunt operations do not work for everyone with NPH. Many people who undergo a shunt operation have substantial symptom relief. In some, the symptoms improve and then start to worsen again. Others benefit little, if at all. Even the experts are not able to predict perfectly who will benefit and who will not. Many surgeons perform a spinal tap before surgery to test whether the symptoms get better with removal of fluid. In some cases, the person is hospitalized for a few days while fluid is drained slowly through a small tube called a catheter. This is another way of checking whether removing extra fluid will help symptoms. The earlier the NPH is diagnosed, the better the chances that the surgery will help. In general, people with milder symptoms have better outcomes with this surgery. Like any surgery, the shunt operation can cause complications. Such complications include infection of the shunt and blood clots around the brain. Your neurologist or neurosurgeon will discuss the pros and cons of this operation and whether it might work for you. Another operation is sometimes used instead of shunt placement. In endoscopic third ventriculostomy, an endoscope (thin tube with a lighted camera on the end) is used to create a small hole in the floor of the ventricles. The hole provides another way for CSF to drain from the brain. If you have NPH, you should have regular visits with your neurologist or neurosurgeon. These visits allow the doctor to monitor your symptoms. Changes in symptoms may require adjustments in care. There is no known way to prevent NPH. A healthy lifestyle, including not smoking, maintaining a healthy weight, and regular exercise, may help avoid conditions such as high blood pressure, heart disease, diabetes, and stroke that might contribute to NPH. Wearing a seatbelt and safety helmet when indicated can help avoid head injury, another cause of NPH. NPH is a progressive condition, meaning that the symptoms gradually worsen if not treated. In general, the outlook depends on the cause of the hydrocephalus and whether you are a candidate for surgery. Some people improve dramatically after surgery, while others do not. Some are not candidates for surgery. Those who are not candidates for surgery have few treatment options available. Coping with the symptoms of NPH can be difficult for both you and your family members. The condition affects every aspect of your life, including family relationships, work, financial status, social life, and physical and mental health. You may feel overwhelmed, depressed, frustrated, angry, or resentful. These feelings do not help the situation and usually make it worse. This is why support groups were invented. Support groups are groups of people who have lived through the same difficult experiences and want to help themselves and others by sharing coping strategies. Support groups meet in person, on the telephone, or on the Internet. To find a support group that works for you, contact the organizations listed below. You can also ask your health care provider or behavior therapist, or go on the Internet. If you do not have access to the Internet, go to the public library. 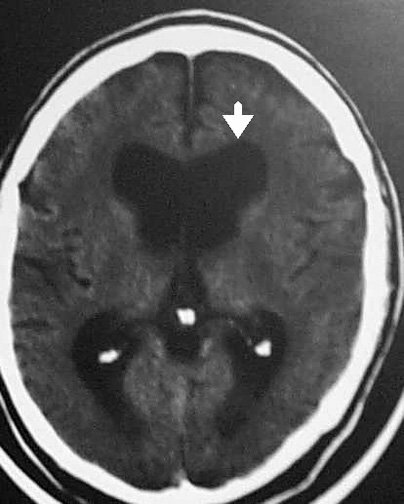 Media file 1: T2-weighted MRI showing dilatation of ventricles out of proportion to sulcal atrophy in a patient with normal pressure hydrocephalus. The arrow points to transependymal flow. Media file 2: CT head scan of a patient with normal pressure hydrocephalus showing dilated ventricles. The arrow points to a rounded frontal horn. SOURCES: American Stroke Association. Hydrocephalus Foundation.